Why you need to think of writing as both a mean to improve the quality of your writing, but also as a means to make money. Writers love to write and love to show what they learn in the format of the written word. Like any artist they aim for quality and also for writing in terms of making enough money for a living. This is simple, and yet it is also complex. One must follow a set of rules. There are many rules which must be followed and learned. There are those which are sometimes so hard and true and then they are not. Writers need to know all of these things. Writing is a changing beast. We all love to write. If you write and publish a book you are an author, and you are a writer the moment you set pen to paper. This is the challenge of writing. There is another challenge that many writers do not think about when they write that first draft. There is only one word which defines writing. Quality is needed to make money with writing, but it is also the cornerstone to the art and craft of writing. What does writing with quality mean? 1) You care about what you are saying to your readers. 2) Your readers are exactly that—readers. 3) You continue and strive to improve on your writing. 4) You understand that there is no such thing as perfect but you are going to aim for that anyways. 5) Your final goal in writing is publishing. A definition of publishing is up to you but for the most part, writers will define publishing as publishing a book. How writing and money will improve your business and make you a happier writer. With the advent and rise of self-publishing and DIY programs there are a lot of new things to learn about when it comes to writing and publishing. Making Money? Is That a Part of Writing? 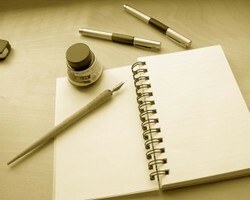 Making money is a part of writing but it is not the reason that one needs to write. In fact, this is the reason to continue to write full-time or write, while working part-time. Money with your writing means that while you will not be a millionaire you will see that there are more "perks." Quality comes first since without quality writing your work will be judged badly and this will affect your money making ability over time. This is one of the hardest things to do as a writer, as it takes time and effort to improve your writing but also make a go at publishing. If you plan on self-publishing the challenge is knowing how much money you need for budget and how long it will take you to write, and edit your work. 1) You never know when unexpected expenses will arise. 2) You must always do your research: When it comes to money or publishing your writing never assume that things will happen as quickly as you would like. 3) Spend only as much money as you have, and do not expect more money coming in. Publishing online really tells someone this story. You might make money with one article, only to have other ones bottom out and you are dealing with less money than you thought. The same goes with a self-published book. One success does not mean “always” a success. Money is a part of writing and it is something you need to consider only, after you have quality writing. When you are writing, whatever you are writing and publishing plan on both. This means that you aim for quality articles or books, but you also market these things so that you do continue to grow and earn. Your plan means that you will spend money on books, but it also means that you have to begin somewhere. That some "where" can be online. This might give you some extra change (money) until you do publish your first few books. Never doubt for a moment your potential as a writer and a published author, but understand that you need quality writing to make money that you want. thanks for stopping by Katiem2- happy to see you. Really good stuff, time tested and a great plan of action. Thanks for sharing your insights. Great article. I have only been doing this online writing thing for a few months now. I have really enjoyed it and feel like the money will come if I keep on writing good quality content. I recognize you from Hubpages. Welcome to the world of Wizzley. hi all great to see you here as well. RebeccaE Nice to see you at wizzley. I just found out about the site. I joined up a s well. I like I like. Many Blessings for your sister at the Wizzley. See you around. Loved your wizzley your information is a keeper indeed. Hugs to you girl. that's teh general idea in my mind the better quality you have the more money you will make long-term. Use this article to learn how to increase your online writing income if you are struggling to make money online. Want to know why as a writer you should be writing an eBook for the Kindle? Find out how the Kindle can kick start your writing career in this article.